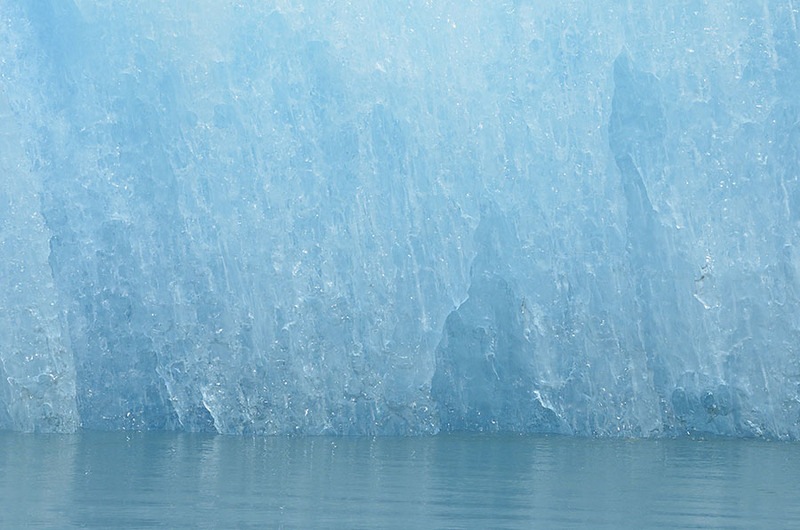 Since we were back in Petersburg we decided to visit the Le Conte Glacier – the southernmost tidewater glacier in North America – the glacier that was the reason Petersburg was founded. It’s all about the ice! 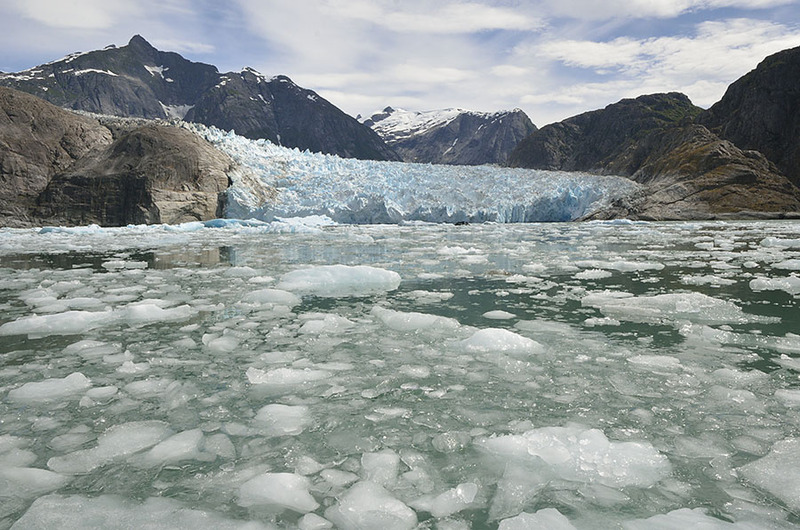 Only 17 miles from Petersburg, the glacier provided a ready supply of ice to keep fish fresh for transporting to markets in Seattle around the turn of the 20th century. 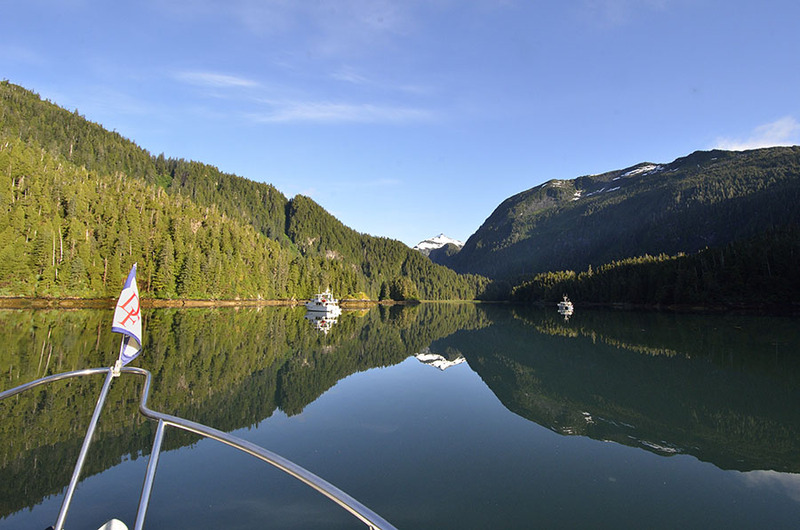 The Le Conte inlet is usually so choked with brash ice that we can’t hope to get ADVENTURES anywhere close so we booked a trip with a local guide on a tough aluminum boat, and enjoyed the chance to focus on photographs and video instead of driving the boat for a change. 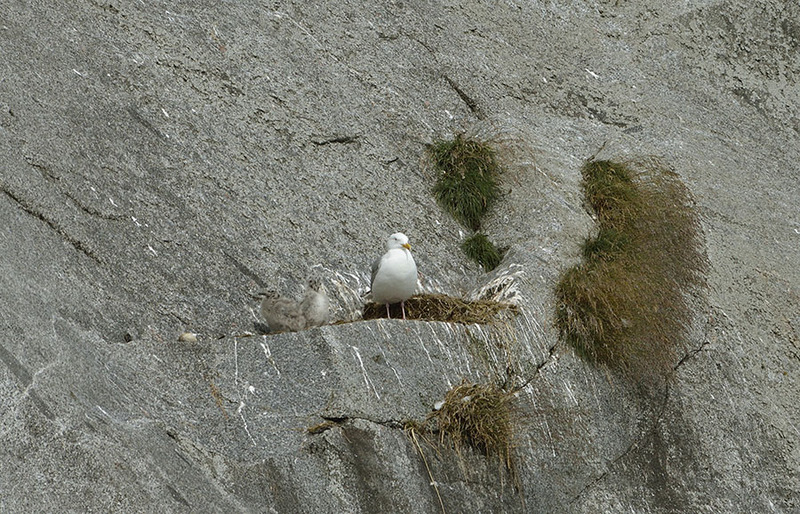 As we picked our way into the inlet we spotted some herring gulls and their chicks nesting on the rock faces. Can you spot the two chicks in this photo? They’re just to the left of the parent – fluffy bits that look just like the rock. …but it’s so beautiful to look at – hard to resist. 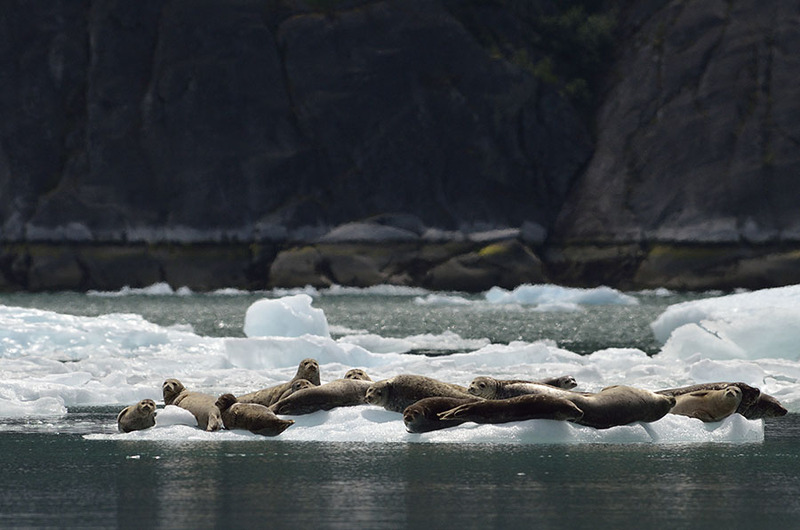 As we finally started cruising out of the inlet we spotted lots of harbor seals hauled out on the ice. 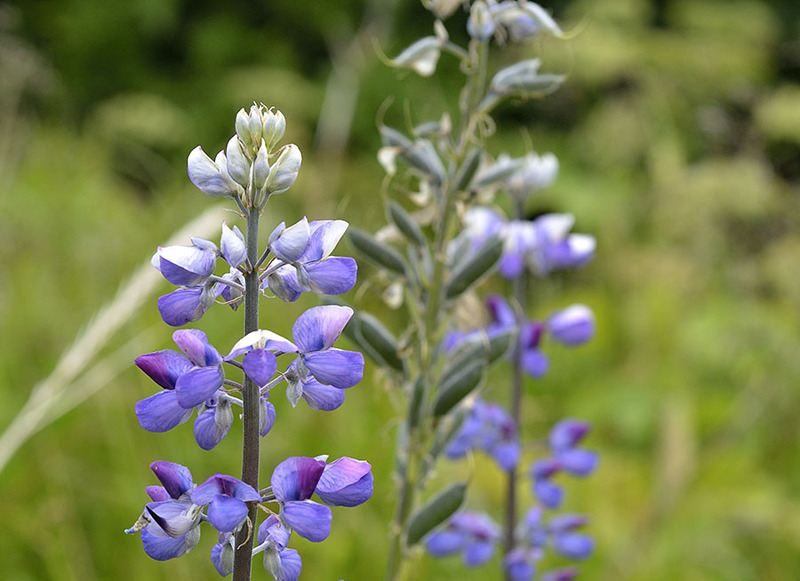 Mothers and pups were plentiful – the pups were probably born in June. 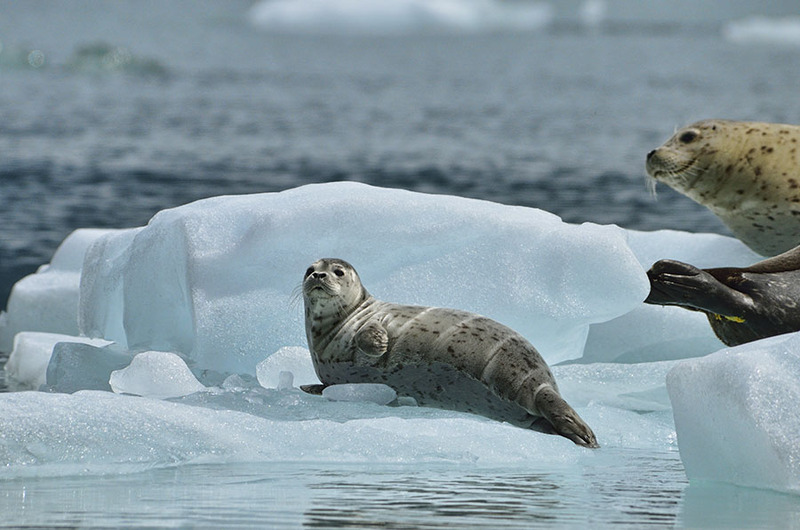 This little pup was on his own while his mother was off feeding, though he had the company of some other adult seals to watch over him. 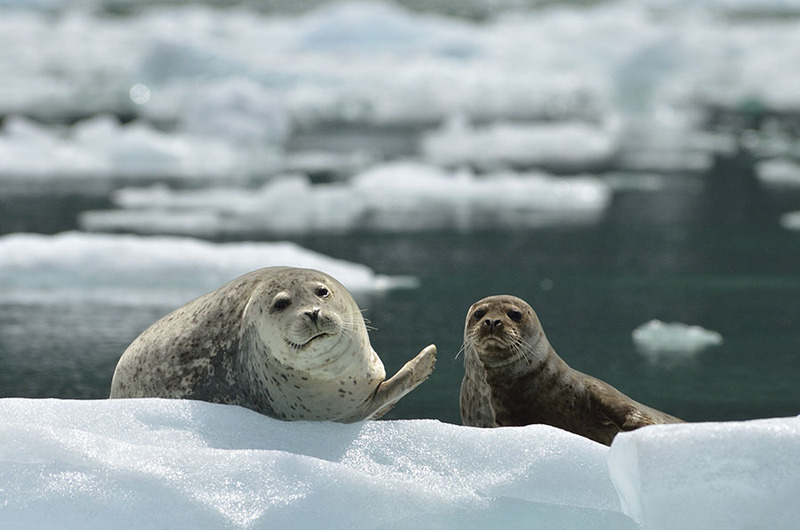 They’re very shy but also very curious, often following behind me in the kayak where they think I don’t see them. 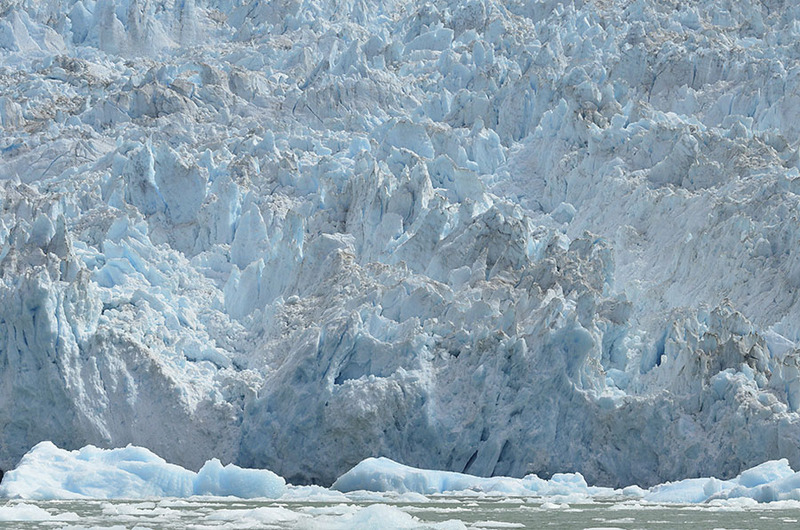 At the entrance to the inlet is a bar – a shallow area that is the terminal moraine of the glacier – the farthest point that the glacier reached, plowing rocks and gravel ahead of it like a gigantic bulldozer. 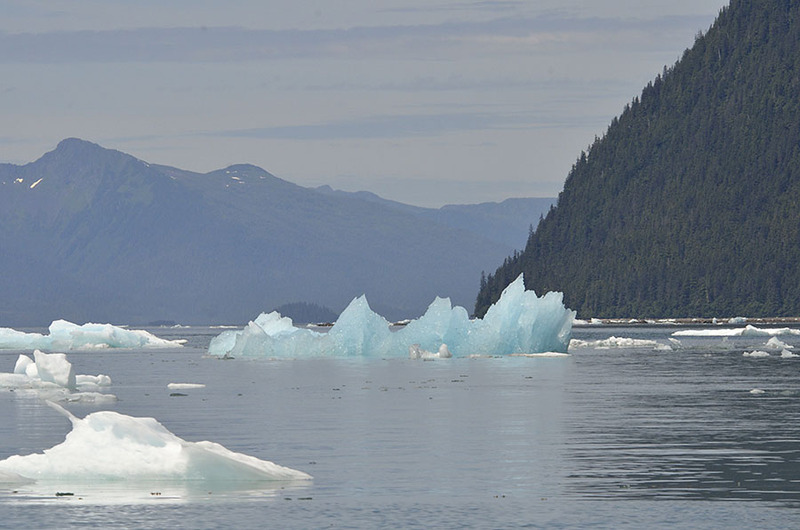 Plenty of bergs were aground on the bar, though some make it across and we’ll find them drifting by in Frederick Sound or even sometimes right past the docks in the Narrows. 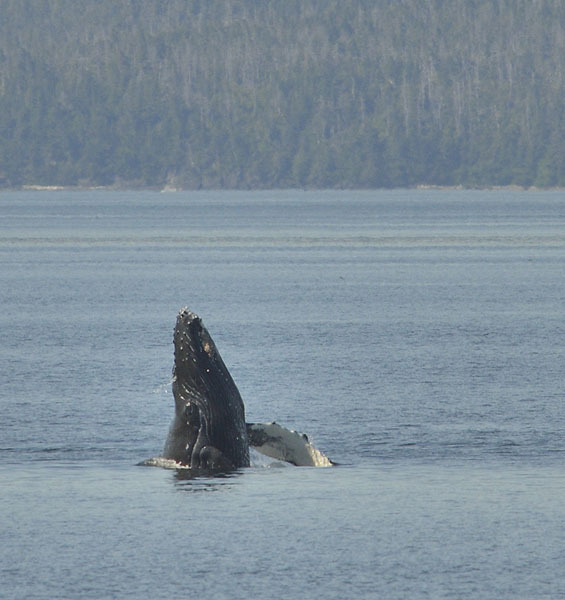 On the way back to Petersburg we spotted a humpback sleeping on the surface… …and a lone male orca cruising along. 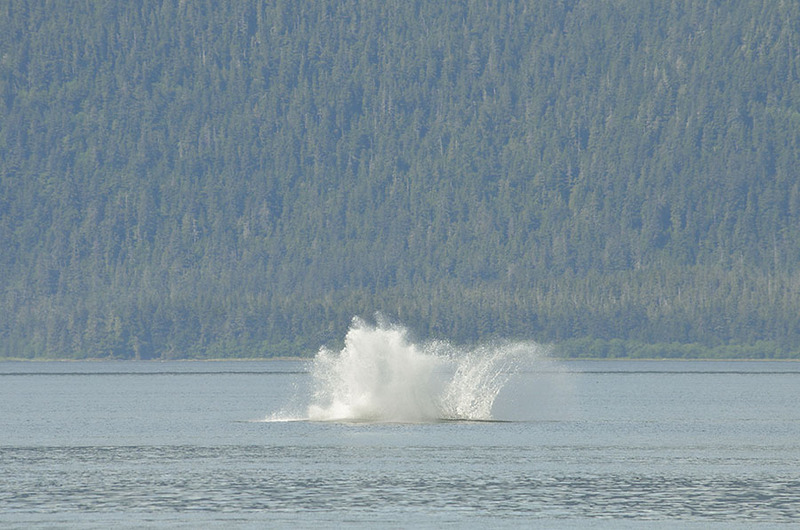 As we approached the buoys marking the entrance to Wrangell Narrows and the town of Petersburg, we were greeted with the usual groans and barks from the Steller’s sea lions that like to haul out there. 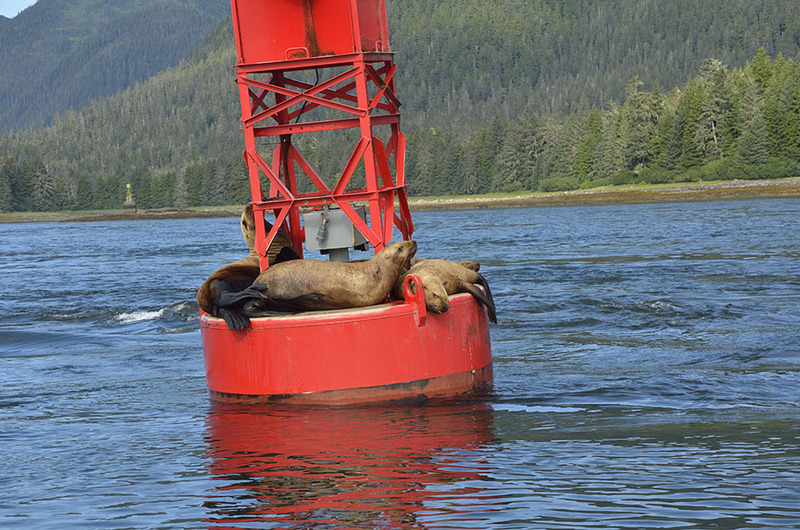 The action around the buoys usually involves a fair bit of napping punctuated by a sea lion in the water who wants some space on the buoy, waking everyone up and causing a kerfuffle. Usually no one wants to make space and the offenders are left to swim around and remain hopeful. 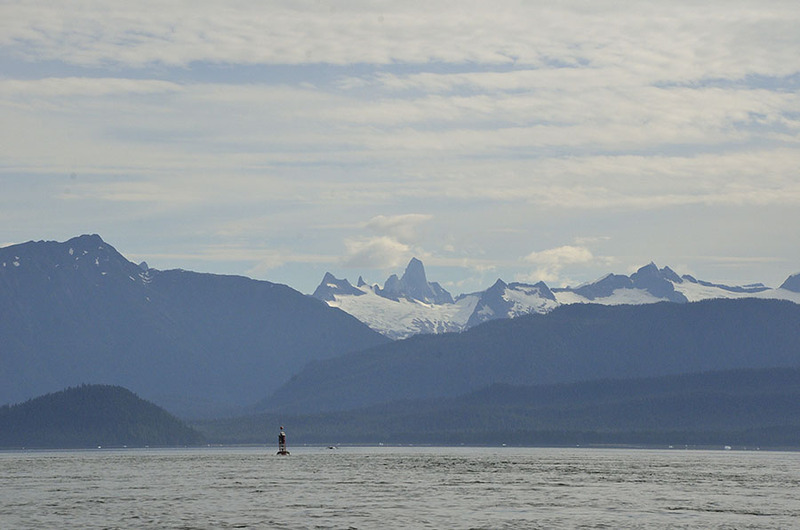 As we headed into the Narrows we turned around to see a nice clear view of the Devil’s Thumb – a 9000′ tall mountain that sits on the US-Canada border, not too far away. We only get to see it on clear days, so it’s appreciated more. Once again things are a bit out of sequence as I try to catch up with all the adventures we’ve been having. One reason is that we’ve been without any good connectivity for long periods of time, and another reason is that it’s very difficult to talk about wonderful things when friends are struggling. One friend is in hospice. Our town remains in great pain after the loss of the two teenage girls on July 4th. And we recently learned that a very dear friend has been diagnosed with a terrible disease. We’re crushed. Our hearts are very broken. 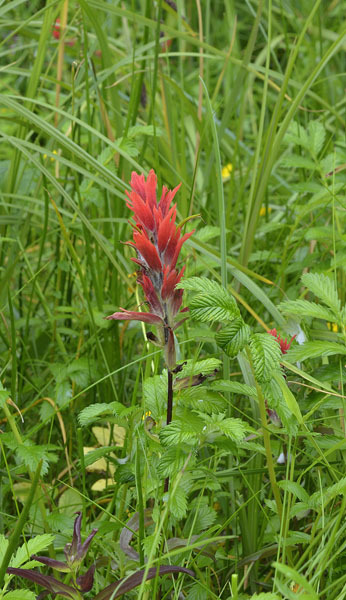 Life is like the flowers and fog of today’s post – sometimes beautiful and sometimes opaque, gloomy and difficult. We’ll share our adventures and the beauty of this wonderful place that we live in, but we do so with heavy hearts right now. 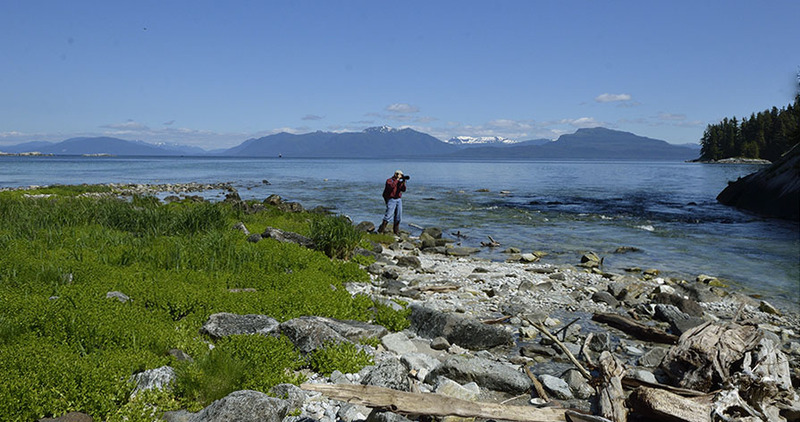 Once the wind settled we moved to Thomas Bay not far from Petersburg, and spent some time on the Cascade Creek hiking trail. The trail follows the rushing water all the way up to a lake, though we didn’t go that far this time. 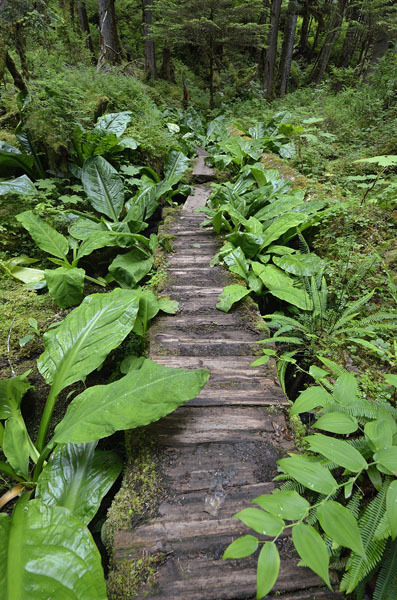 Some of the trail is a boardwalk over the muddiest places… …and the Forest Service trail crews have been making a lot of improvements to the upper trails, replacing old rotted wood and carving steps into the boulders. 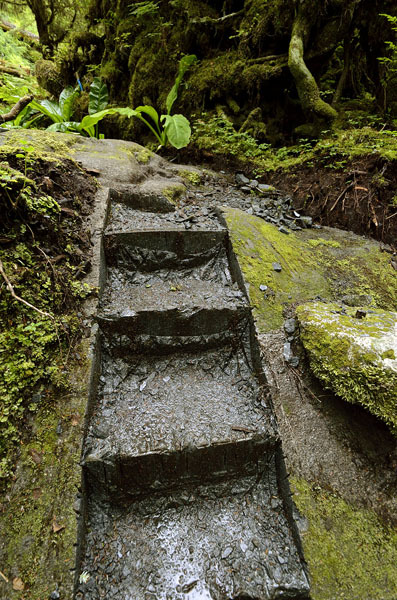 Can you imagine how difficult it is to chisel out these steps? Whatever equipment they use must be big and heavy, and somehow they haul it up to the higher sections of the trail. 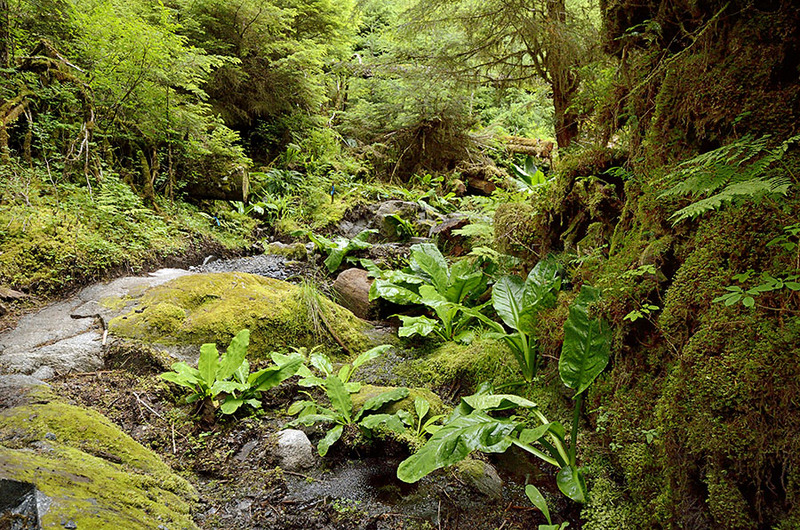 Very impressive – this is wild and rugged terrain. After a couple of days we needed to return to town, and although the morning started bright and beautiful we noticed some tendrils of fog reaching into the anchorage. We hoped the fog was just in the bay, but it quickly socked in and we were in pea soup for most of the trip back to Petersburg. We heard our fisherman friend Ray on the radio – he alerted us that there were gillnetters fishing out in the Sound and told us to hug the far shore to avoid them. There would have been no way to miss their nets if we were out in the middle! Ray has an interesting fishing boat – it’s a DeFever 40 that has been converted for commercial fishing. He loves to brag about VIDA’s sea-keeping qualities, and her ability to throw off big waves. 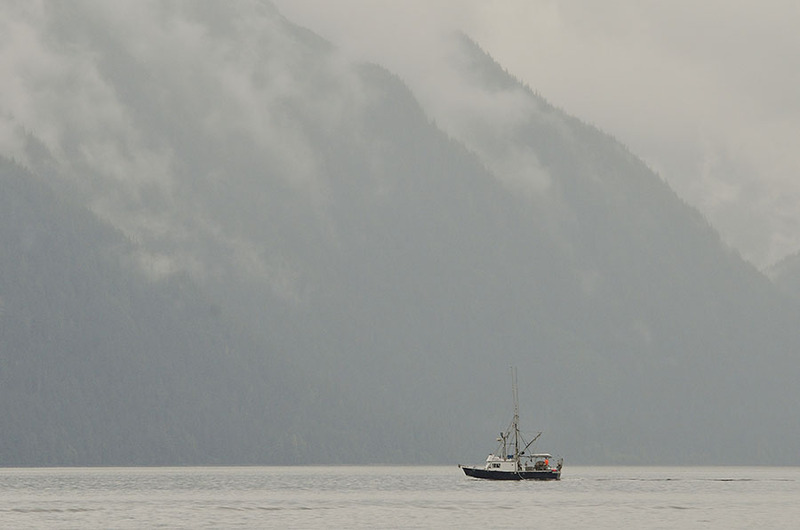 We get to (mostly) choose the weather we venture out in, but the fishermen go out in all conditions. We think Arthur DeFever designed superb sea boats, but it’s nice to hear it from the professionals. 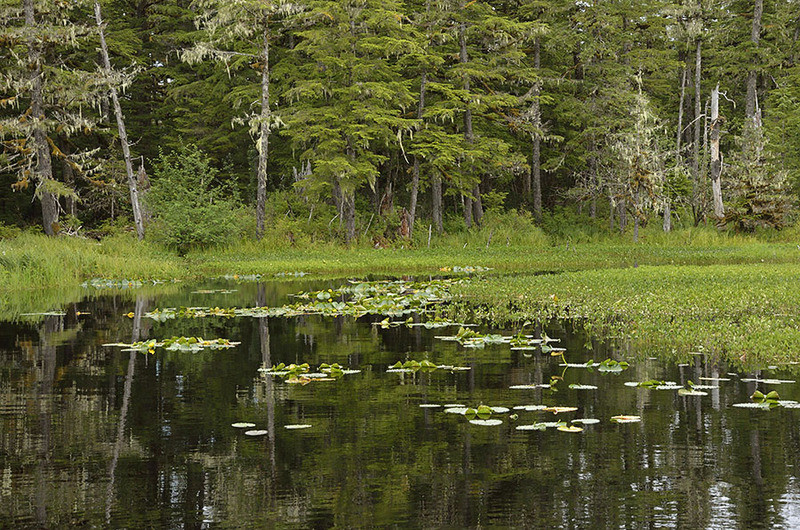 Back in town we did a little hiking – one of our favorite trails is the Ohmer Creek Trail, with a nice mix of forest, muskeg (Alaskan bog), a stream and pond. 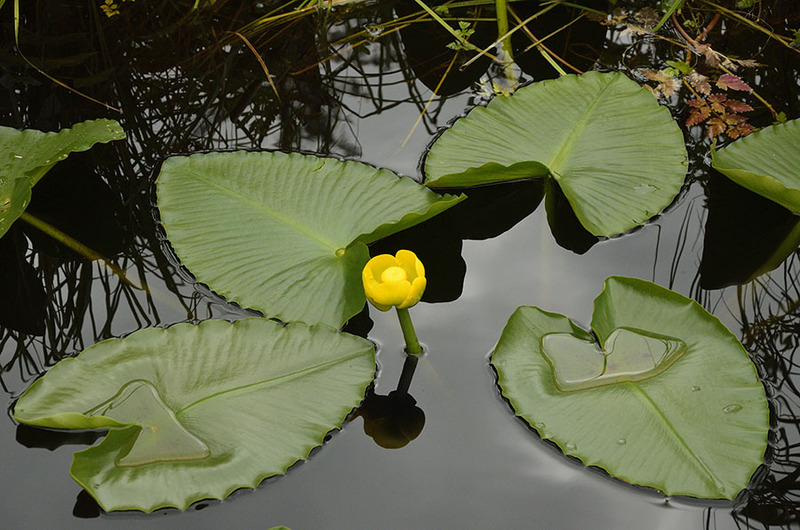 The water lilies are just starting to bloom – so beautiful. 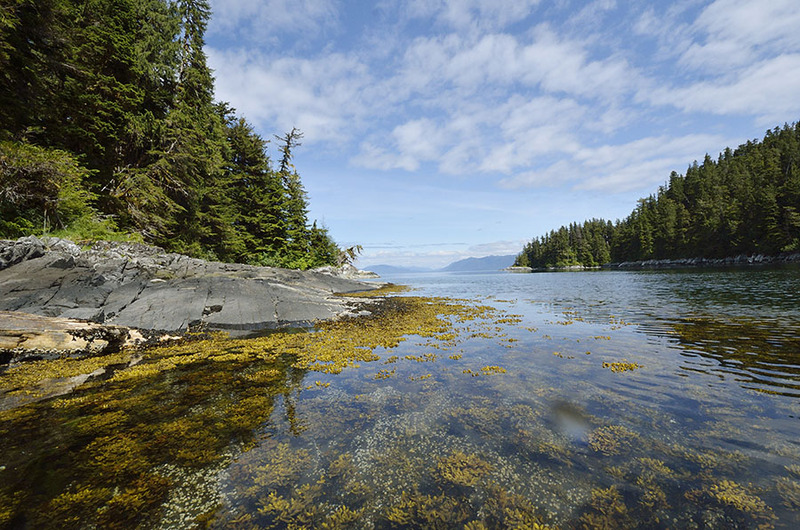 Many of you have probably heard of Sitka – it’s located on the western side of Baranof Island. 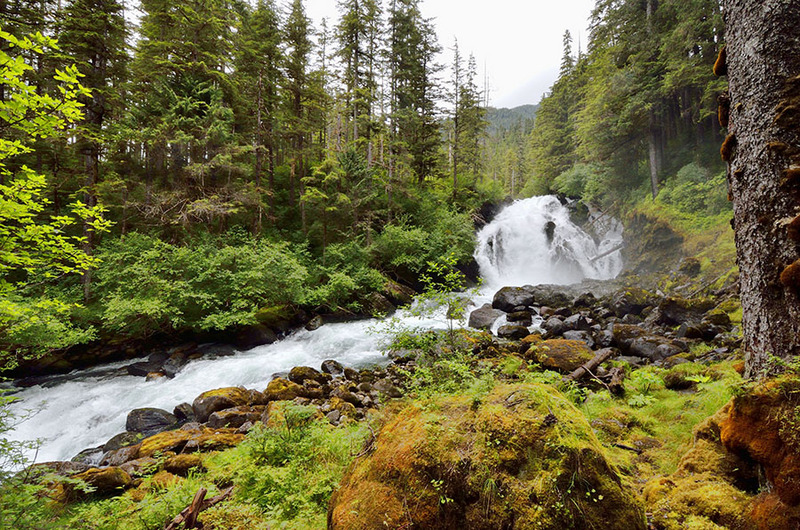 What you may not know is that the eastern side of Baranof is known as the “waterfall coast”, with countless waterfalls at every turn: tall ones, short ones, wide ones, and silvery little ribbons. We tucked into Ell Cove (Lat/Lon: 57 11.93 N / 134 50.98 W) to explore a new place, and loved the cozy protection this L-shaped pocket provided. 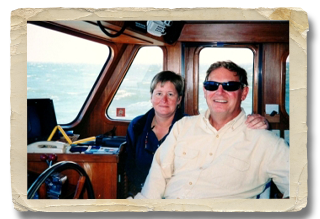 We were graced with beautiful weather, and flat seas out in Chatham Strait. Of course the kayak hit the water the minute our anchor was set, and with the benign conditions outside the cove I could check out the rocky shoreline and little patches of white sandy beach. Just to the north I played in the rushing creek from one waterfall, and just to the south I had a view of the dramatic Kasnyku Falls (located in the aptly named Waterfall Cove). Kasnyku Falls drops over 400′ from a mountain lake, and it’s hard to grasp the scale of it without some point of reference. Jim graciously volunteered to climb ashore and pose next to the falls for me, which was especially brave since we spotted a brown bear and two small cubs on the left side of the falls as we approached. The bears moved into the woods when they spotted us and I dropped Jim ashore on the opposite side, but the falls were roaring so loudly that his clapping and “hey bear!” announcements were almost impossible to hear… we both kept a sharp lookout. 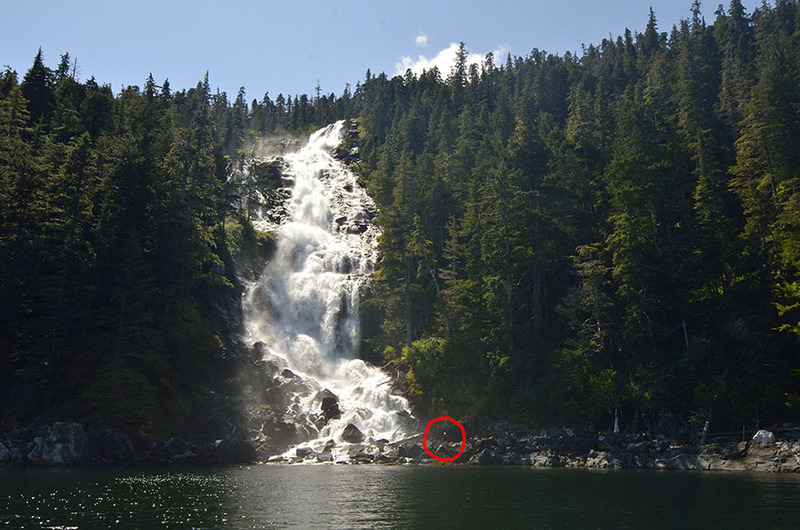 There’s brave Jim – circled in red. He’s such a good sport about photo-ops. 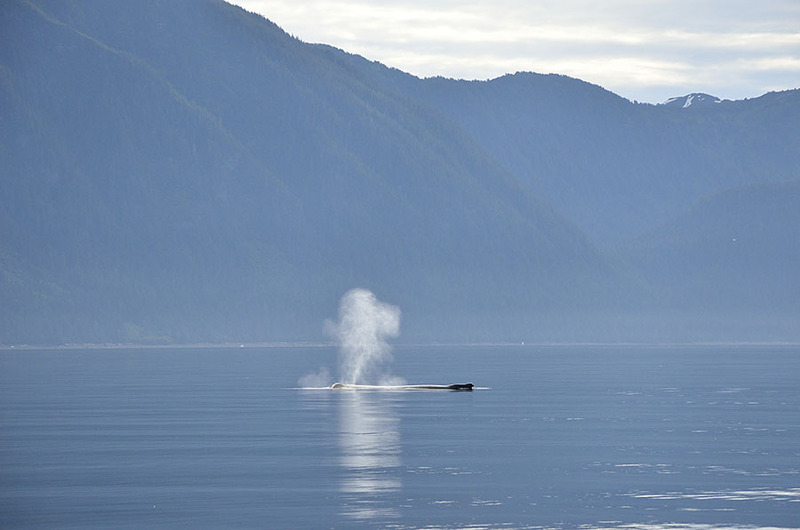 While exploring with the dinghy we spotted about half a dozen purse seiners fishing for salmon, and at least two of the boats closest to us were Petersburg boats. 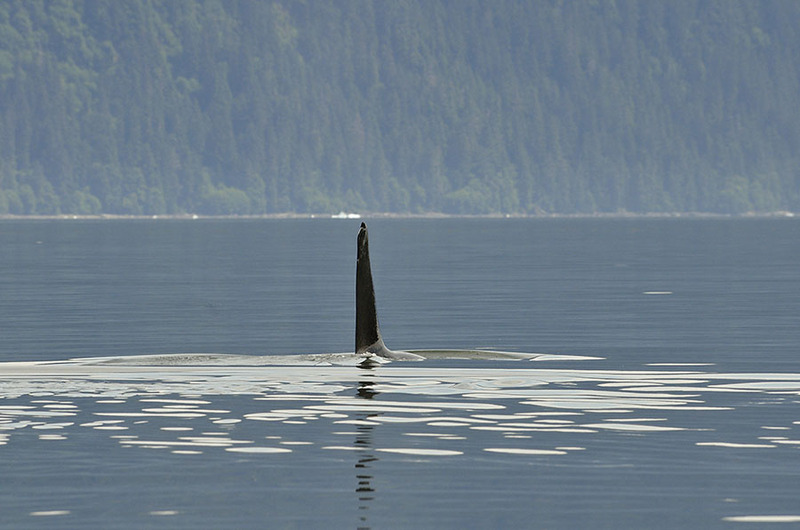 It was a treat to float near the seiners and watch the beautiful ODIN working up close. The purse seine is a net about 1200′ long that hangs approximately 40′ down and is drawn out from the boat by a powerful seine skiff. (A brand new seine skiff like the one shown below can cost over $200,000.) 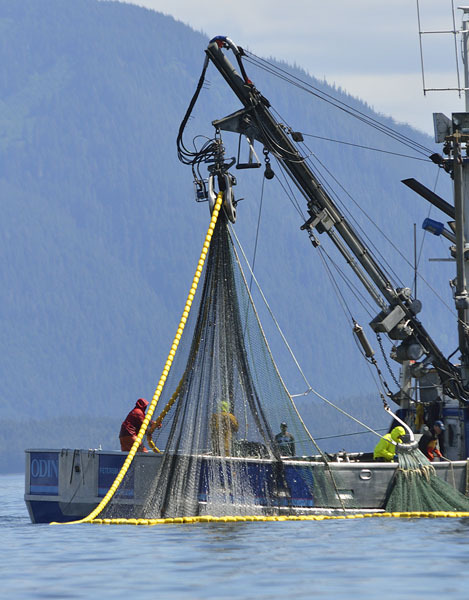 Once the net is fully deployed, the skiff and the main boat work together to draw the net around in a circle to enclose the fish, and at the same time they draw the bottom of the net closed – forming the “purse”. 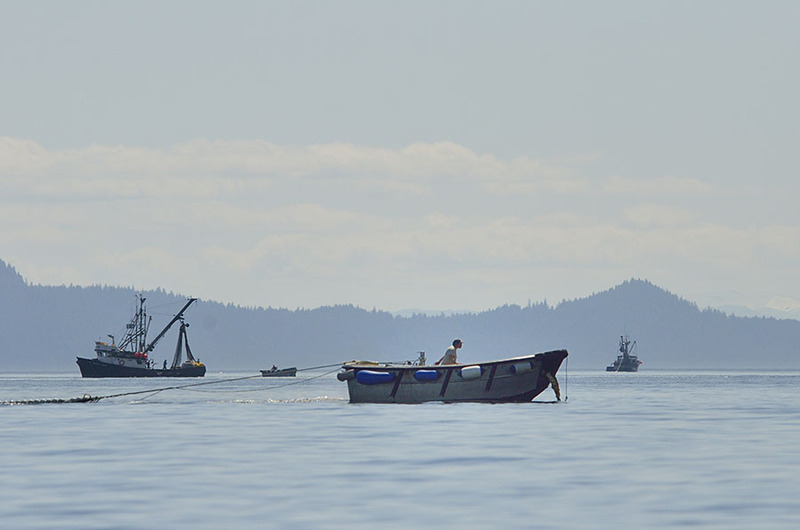 The seiner begins to raise the net, and the skiff moves around to the far side of the seiner to provide some pull and counter-balance. If the net is very full of fish the seiner could topple over without some help from the skiff. Fishing is challenging, working in all weather conditions day or night but it also requires a great deal of knowledge and expertise in so many areas: biology, oceanography, meteorology, mechanics, navigation, business, finance, and mastery of complex regulations. 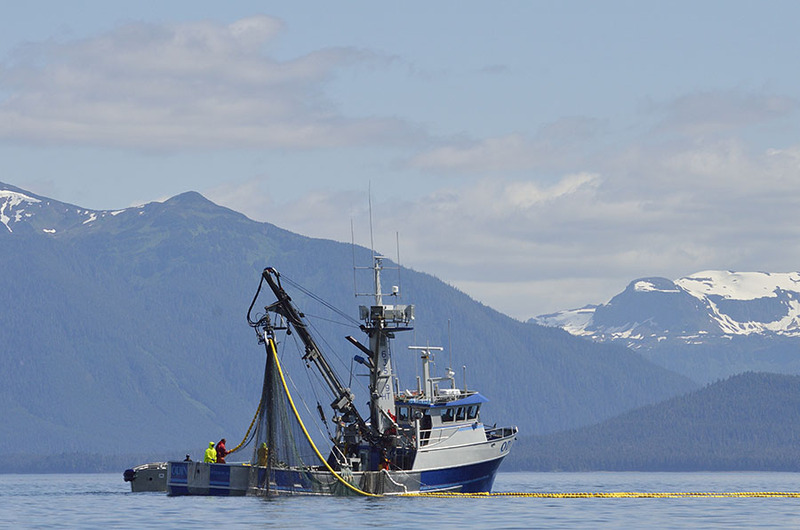 Each successful purse seiner like the ODIN represents a multi-million dollar business, and we have many of them here in Petersburg. 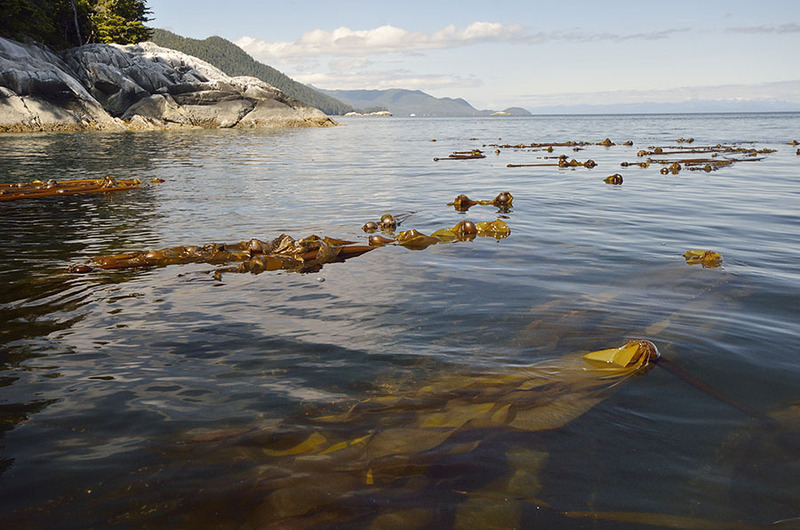 I ventured out in the kayak again, playing in the current near some bull kelp watching the long fronds swirl in the flowing water. 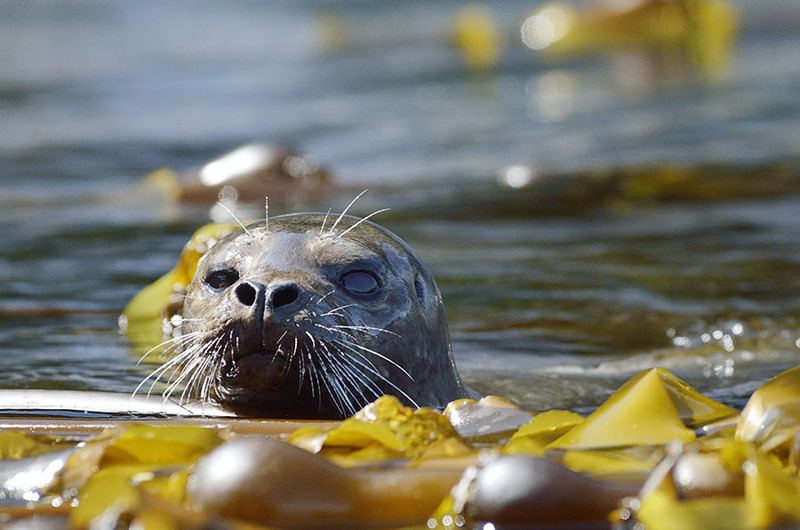 A little seal popped up to spy on me – they are very shy but also very curious. I sat still to watch him – he would dive and vanish for a few minutes and then reappear closer each time. 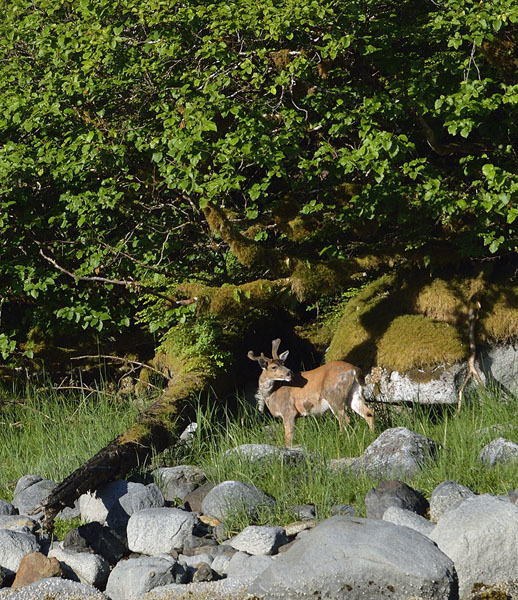 We spotted a few deer on the shore, noticing that this one still hadn’t lost all his winter coat. It’s interesting to see the difference between the brown-gray winter coat and the brighter orange-y summer one. 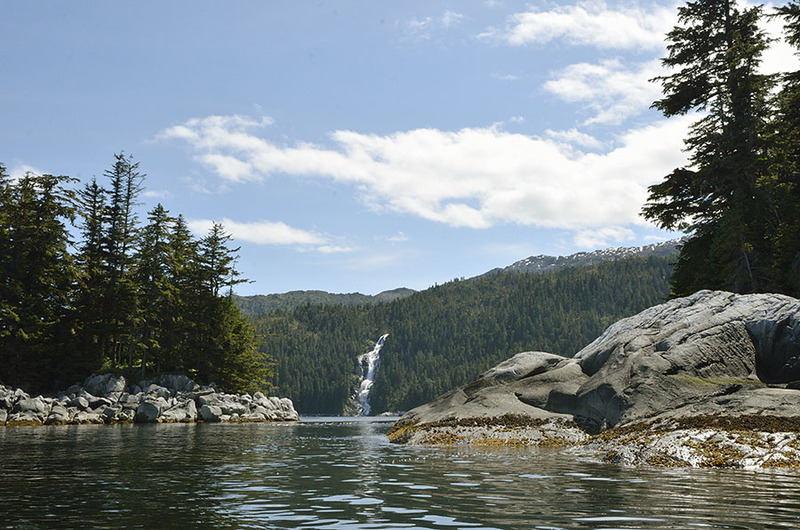 We loved Ell Cove but it was time to move on just a few miles farther south along the waterfall coast to Takatz Bay (Lat/Lon: 57 08.01 N / 134 51.39 W) – a large protected bowl surrounded by tall mountains. The reflection in the early morning calm is magical. 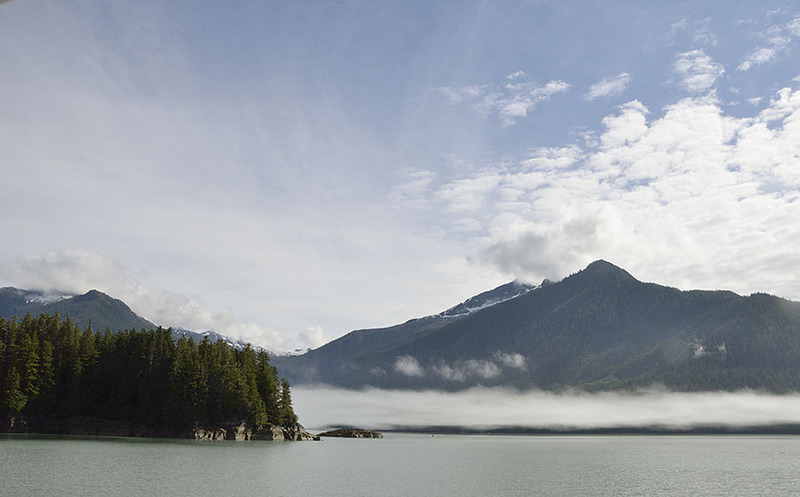 Despite the mountains and the lack of any nearby civilization, we can get some decent Internet and voice signal in Takatz Bay so we were able to secure a permit to see the Tlingit Tribal House dedication in Glacier Bay in late August. 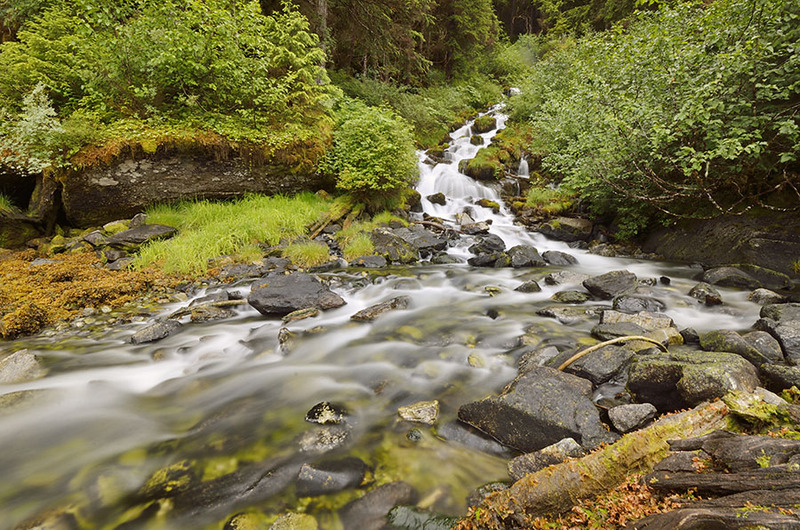 I also love some of the smaller waterfalls, experimenting with long exposures of the rushing water. We returned to Petersburg to enjoy the three-day-long celebration for the Fourth of July – a real old-fashioned family event. The highlights were to be the parade and the log rolling contest, capped off by fireworks later in the evening. We went beachcombing in the morning on July 4th, rushing back to downtown in time for the parade at 11am, but there was no parade… just little groups of people looking somber or sad. We finally found someone we knew and asked what was going on, and they told us that there had been a car accident earlier in the morning. Two girls, aged 18 and 19 lost their lives and two others in the car were injured. One of the girls who died just graduated from Petersburg High a month ago, and the other graduated last year. These good, hard-working young people were working for Parks and Recreation, setting up for the day’s events when the accident occurred. The anguish around town is overwhelming and heartbreaking. All the day’s events were cancelled, of course, except for the fireworks which would create a safety challenge to disassemble. The town organized a brief prayer service in the evening in the middle of downtown, and then we all – hundreds of people filling block after block of the streets – carried candles and walked up to the ball field where 80 sky lanterns were released into the night. It was very moving and beautiful. The fireworks followed – a little ease for heavy hearts. So many people that we care about are struggling with difficult situations here and elsewhere, and every day we pray that they find healing and comfort.